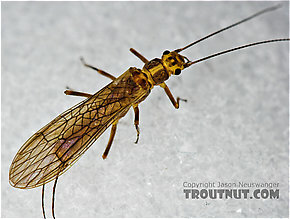 The behavior and habitat of Plecoptera. 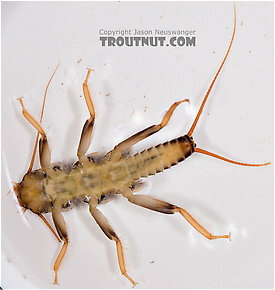 6 underwater pictures of Plecoptera. 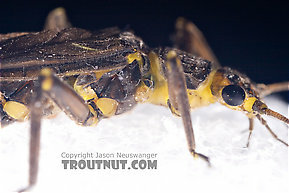 Isoperla (Stripetails and Yellow Stones) Stonefly Adult View 14 PicturesA friend brought me this stonefly to photograph. 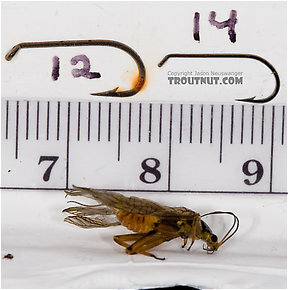 He found it floating on the surface of a trout stream with its wings in a crippled position. 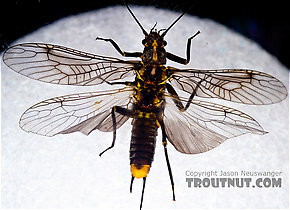 Female Helopicus subvarians (Springfly) Stonefly Adult View 11 PicturesI caught this female during her egg-laying flight. 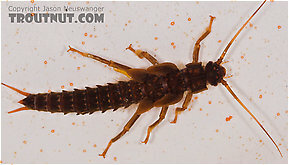 Isoperla (Stripetails and Yellow Stones) Stonefly Adult View 10 PicturesSeveral stoneflies of this species were flying around a small stream last night. I tied on a brown drake imitation of about the right size/color to approximate these stones, and was rewarded with a hard-fighting 17-inch brown trout. 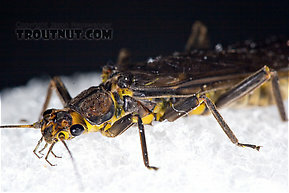 Shuck: The shed exoskeleton left over when an insect molts into its next stage or instar. 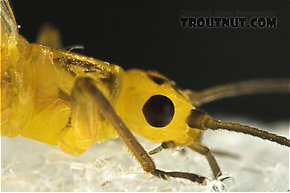 Most often it describes the last nymphal or pupal skin exited during emergence into a winged adult.) 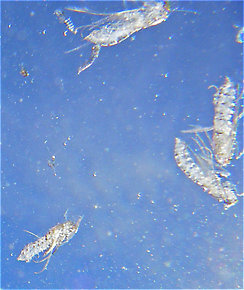 it emerged from. I was surprised by just how light it was shortly after emerging. I photographed it a couple days later when it had darkened considerably; it was a pale, almost pastel yellow at first. Schwiebert, Ernest G. 1955. Matching the Hatch. MacMillan Publishing Company.